Electric power can be transmitted or distributed either by means of underground cables or by overhead lines. The underground cables are rarely used for power transmission due to two main reasons. Power is generally transmitted over long distances to load centers. So installation cost for underground transmission will be very high. Electric power has to be transmitted at high voltage for economic reasons.It is very difficult to provide proper insulation to the cables to withstand such higher pressures. Therefore, power transmission over long distances is carried out by using overhead lines. With growth in power demand and consequent rise in voltage levels, power transmission by overhead lines has consumed considerable importance. An overhead line is subjected to uncertain weather conditions and other external interferences. This calls for the use of proper mechanical factor of safety in order to ensure the continuity of operation in the line. In general, strength of the line should be such so as to provide against worst probable weather conditions. Mechanical design of overhead lines and their components of overhead lines is discussed below. The supports: Poles or towers depending upon the working voltage and the region where these are used. Cross arms and clamps: These are either of wood or steel angle section and are used on pole structures to support the insulators. Insulators: Which are attached to supports and insulate the conductors from the ground. Conductors: Which carry electric power from sending end station to the receiving end. Guys and stays: Braces or cables are fastened to the pole at the termination. Lightening arrestors: To discharge excessive voltages built upon the line, to earth due to lightning. Fuses and Isolating switches: To isolate different parts of the overhead system. Continuous earth wire: It is run on the top of towers to protect the line against lightning discharges. Vee guards: They are often provided below bare overhead lines running along or across public streets to make the line safe if it would break. Guard wires: They are provided above or below power lines while crossing telephone or telegraph lines. Phase plates: In order to distinguish the various phases. Bird guards: A stick of ebonite with rounded top is fixed near the insulator on the cross arm to prevent flash over due to birds peeking on the conductors. Barded wire: Over some portion of the pole at ant climbing device. The continuity of operation in the overhead line depends upon the judicious choice of the above components. Therefore, it is profitable to have detailed discussion on them. The supporting structures for overhead line conductors are various types of poles and towers called line supports. In general, line support should have the following properties. 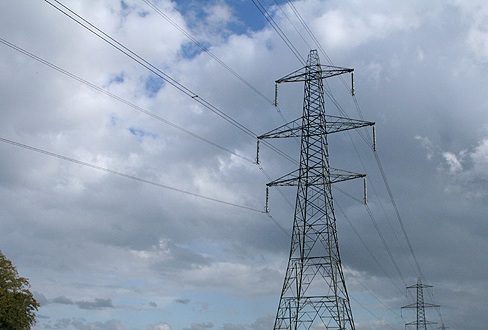 The line supports used for transmission and distribution of electric power are of various types including wooden poles, steel poles, R.C.C poles and lattice steel towers. The choice of supporting structure for a particular case depends upon the line span, X-sectional area, line voltage, cost and local conditions. These are made of seasoned wood i.e. sal or chir and are suitable for lines of moderate X-sectional area and of relatively shorter spans, upto 50 metres. Such supports are cheap, easily available, provide insulating properties and, therefore, are widely used for distribution purposes in rural areas as an economical proposition. \the wooden poles generally tend to rot below the ground level, causing foundation failure. In order to prevent this, the portion of the pole below the ground level is impregnated with preservative compounds like creosote oil. Tendency to rot below the ground level. Comparatively smaller life 20 - 25 years. The reinforced concrete poles have become very popular as line supports in recent years. They have greater mechanical strength, longer life and permit longer spans than steel poles. Moreover, they give good outlook, require little maintenance and have good insulating properties. The holes in the poles facilitate the climbing of poles and at the same time reduce the weight of line supports. In practice, steel, wooden and reinforced concrete poles are used for distribution purposes at low voltages, say upto 11 kv. However, for long distance transmission at higher voltage, steel towers are invariably employed. Steel towers have greater mechanical strength, longer life, can withstand most severe climatic conditions and permit the use of longer spans. The risk of interrupted service due to broken or punctured insulation is considerably reduced owing to longer spans. Tower footing are usually grounded by driving rods into the earth. This minimises the lightning troubles as each tower acts as a lightning conductor. The double circuit has the advantage that it ensures continuity of supply. In case there is breakdown of one circuit, the continuity of supply can be maintained by the other circuit. Insulator play an important role in successful operation of overhead transmission or distribution lines. Properties of insulators, different types of insulating materials used and types of insulators like pin type, suspension, shackle, strain and egg or stay type insulators are described brief in the link below. click below link for detailed full article on insulators in overhead transmission. Insulator in overhead transmission and distribution. click here. The material which carry electrical power from sending end to receiving end is called a conductor. Conductor sizing in overhead transmission, types of conductors materials used, different types of conductors like solid conductors, stranded, ACSR type conductors are briefly described in the below link. Click on the link to view full article on conductors.